I’m a boholano and we are a supplier for SOLAR-BASED Street Lamp based in Manila. We want to offer this new, CHEAP and no-carbon footprint, green-energy SOLAR STREET LAMP for most of municipalities of Bohol provinces. This Solar Street Lamp is easy to install and we have range of models for barangay road (5W), municipal roads (10-20w) and national highway (50w and above). All are plug and play and no need to replace existing poles! Kindly advise whom to contact and we are willing to present this personally. Thanks kaayo. Since street lighting is a responsibility of the municipalities and cities, perhaps it would be best to present your proposal to the League of Municipalities of the Philippines (LMP) Bohol Chapter through its current president Mayor Lloyd Peter Lopez of the Municipality of Loon. Also you may want to present your proposal to the League of Planners Bohol Chapter headed by its current president Engr. Efren Logroño, MPDC of the Municipality of Buenavista. For the Provincial Government of Bohol, we also forwarded your message to the Acting Provincial General Services Officer Mr. Glicerio Doloritos. We are affiliated with Langenburg Technologies USA promoting water to power energy. This is highly advanced technology in the market for power generation. It has the best edge technology that man has ever invented so far. We understand that you are using diesel power plant for power generation. We would like to offer our equipment technology supply with you on a very lucrative initial investment from your side. Our generation units are modular and capacity range from 1 to 280MW power supply with a total area of installation of approximately 50 meter by 50 meter and it must be installed beside a water source. Water source can be river, sea, lake or any type of polluted/brackish water. It is not only power that this unit generates but also potable water that is used for human consumption. In terms of environmental compliance, this unit has no carbon or any type of harmful gas emission but only water vapor. We are interested to put a pilot project in Asia specially in the Philippines to showcase this technology for future generation. Langenburg engineers and their technicians will set up and install the plant for you at same time they will manage the operations and maintenance of this unit in 25 year lease. Your input will be the initial investment, the location to install the unit, hook up to the grid or any location and the Power Purchase Agreement. In the event that nobody can be able to invest a minimum of $5M USD, we have investors here in America to provide such capital. The owner also encourages investors to see the demo unit they have in Eugene, Oregon, USA. I went to see this unit myself to witness this incredible invention. I am Professional Mechanical Engineer back in Philippines and I know how power station works since I had extensive experience in coal fired units in China and the Philippines before migrating to Canada. If you believe there is room for investing this unit in your province, we would appreciate to hear from you. Upon your reply, I will send a technical power point for your further information. You can email me at cionrico@yahoo.com or txt me on my cell phone +1-604-512-7645 and I will call you back. 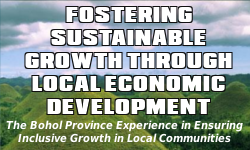 Thank you for your interest in contributing to the development of Bohol. Indeed, the Province is inviting private investors to help for the development of sustainable and affordable power supply to cater to the future needs of Bohol. As to your proposal, may we suggest that you present this to power producing companies in the Philippines who may be interested of using your technology for Bohol. However, if you and your company may find it feasible to put up your own power supply in the Province after proper due diligence study considering the power industry regulations in the country, you may coordinate with the Department of Energy (DOE) for proper guidance on the process. At the local level, you can also present your proposal to the Bohol Energy Development Advisory Group (BEDAG), which is headed by the Provincial Governor. I am a resident of Baclayon, Bohol and represent a Norwegian-Technology Solar and Wind Company SOWI. We have installed several projects in Bohol and across the country and an active advocate of clean GREEN ENERGY. We installed the 25KWp grid-tied solar array system for BRRP (Bohol Rehabilation and Rebuilding Program) at the IHMS Seminary in Taloto through Fr. Val Pinlac. This has a hybrid segment that continues to supply power even during brownouts. We will also be installing a 127KWp solar hybrid for University of Bohol on February this year. I am very interested in participating in the 100MW solar farm bidding that can supply the baseload requirements for Boheco 1&2, and Bohol Light. We can also develop a wind/solar hybrid for such an undertaking. We can fully finance the entire project via a PPA and BOT arrangement, or outright purchase. Please let me know what steps I need to take in order to participate in the bidding process. For details and information, you may contact the following of the One Bohol Power Project (Joint BOHECO I & II) at tel. no. (038) 508-9731 or through email at boheco_main@yahoo.com. Look for Engr. Dino Nicolas Roxas, Engr. Danilo Quidlat, or Engr. Algerico Siga. I’m Jan-jan Baguio, a representative from a Power Generation company. Our Company is currently looking for potential Power Projects and we find Bohol as an attractive market given it’s booming economic activities. I would like to inquire, is the Bohol Energy Development Plan already completed? where can I get a copy of the said Plan? The Bohol Energy Development Plan is still being processed for finalization, according to the BEDAG secretariat. If you’d like to present your proposal, you may contact the BEDAG secretariat for proper guidance. Imelda Macaraig here for Power Dimension Inc.Power Dimension, Inc. (PDI), a license General Contractor for Civil Construction, Interior Finishing, Electro- Mechanical Installation, is signifying its interest to design, construct, fabricate, supply, deliver and install all required materials and equipment of your various project. Power Dimension, Inc., has been involved in General Construction works in some of industrial and commercial establishments all over the Philippines. Power Dimension, Inc. (PDI), undertakes Co-generation, HV substation, transmission and distribution projects with highlight on the technology and equipment for LV to MV power supplies, mechanical installation, industrial automation & instrumentation and Commercial installation Including design and supply, installation commissioning and maintenance. Thank you very much for giving us the opportunity to submit our company profile and we do hope that PDI will be your first choice for your engineering needs not just on your next requirement but for the one after that. We will inform you ASAP of the name and contact no. of the winning bidder for the power plant to be established in Bohol. One Bohol Power (composed of BOHECO I, BOHECO II and Bohol Light, Co., Inc. (BLCI) have organized a Procurement Board and Bids and Awards Committee that will conduct the bidding by August 2017, hopefully. Bidders are private companies engaged in power generation (solar, hydro, wind, liquefied natural gas, bio-mass, coal, diesel). We are interested to build a power plant in Bohol to serve as base load to cater the need for stable and reliable power in bohol. A joint venture with China New Energy and Adnama Mining Resource Inc, (AMRI) will be formed for this project. Mr. Fernando “Ding” Borja is the president of AMRI. The JV intends to put a 150 MW Circulating Fluidized Bed Coal Thermal Power Plant in Bohol. Our Chinese partners have already visited Bohol for the site preference. May we therefore inquire when will be the bidding documents be ready and when is the pre-bidding conference. We may also inquire what documents/information you need from us to formalise our intent. Thank you for your interest of putting up a power plant in the Province of Bohol. For your guidance, the specific schedule of pre-bidding conference is still to be determined pending on the finalization of the tender documents for the competitive bidding by the One Bohol Power (the Aggregation of the 3 Distribution Utilities in Bohol). The BEDAG secretariat will then inform you on the updates. Thank you very much.